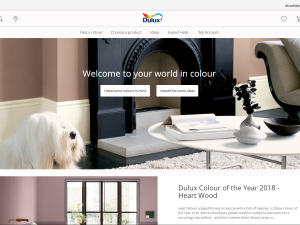 Dulux is the UK’s leading paint brand, with a wealth of products and services designed to help you find the colours that you’ll love in your home, and give you the expert knowledge you’ll need to achieve great results. There are a wide range of products to choose from regardless of whether you are painting a hallway, bedroom, lounge, kitchen, dining room or bathroom. The Dulux range covers everything from undercoats and primers to emulsions and gloss paints, suitable for a variety of surfaces. Head over to the Dulux website to find the widest range of Dulux products available in one place, including over 1,000 colours mixed, quick and convenient delivery, and free delivery on paint testers. Dulux Magic White – fades from pink to white in one hour, making sure you never miss a bit of wall when painting.